I woke up early, planning to make char siew bao as I have the fillings ready in the fridge. Then I got distracted by the vegetable compartment in the fridge. It was the smell coming from it. Totally freaked out when I see the amount of food I have to throw out! Root vegetables on top of tomatoes (totally mashed) and leafy vegetables. I thought I didn't have limes (for my dry mee siam) but ended up I have way too many! The list is endless and I ended up with a big bag of rotten food in the bin. Now my fridge is smelling great! Since it is school holiday, I have my kids with me for the full day. This one week is actually not really a rest and relax break for the kids. In fact, this will be the time for the kids to catch up what they were weak in to prepare for the final exam which is in month end. Son did improve on his grades as compared to CA1 and SA1 but teachers said that he could have excels further. Being him, complacency always sets in and thus he needed to be pushed. Pushing him is the hardest. He just lacked that will power to focus and that is frustrating. To break the negative vibes in the house, I brought the two kids out for lunch with my sister. Then we headed to the library to get some books (to deter them from hooking on to that stupid gadget call phone) and to replenish food that I thrown out. Just after I cooked dinner, my youngest sister called and said that my uncle is in critical stage. I didn't even have time to take a shower or dinner, rushed to pick up my mom and sister and off we went to the hospital. Thus this one week, we will have to be on standby. On a happier note, yesterday I baked a Cranberry Yoghurt Cake. A hello gift for my French neighbours. This cake is really yummy. Moist and delicious. Pre-heat oven to 180ºC. Grease and line a 20cm round pan with baking paper. Mix yogurt, sugar, eggs in a large bowl. Add ground hazelnuts and sieve over flour and baking powder. Mix till combined. Pour batter in the prepared pan, arrange cranberry on the batter. Bake for 40-50mins or until a skewer inserted into the centre comes out clean. Let cool in the pan for 20mins before unmoulding. 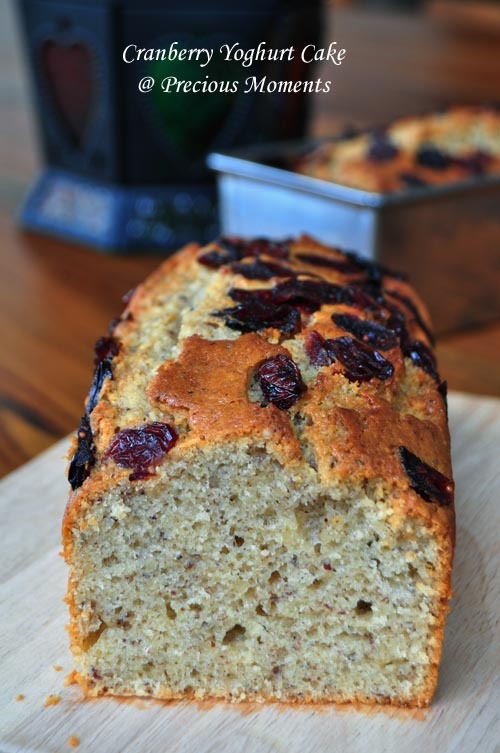 Your cranberry yogurt cake look so beautifully baked! This recipe itself makes two loaf out of it? Must be delicious! Edith, did you compost the rotting veges? This happens to me too, I sometimes over buy and end up wasting. The cranberry yoghurt cake looks very good. Oh and the cranberries are soaked in rum. Hmmm....I have rum in the pantry and need to buy cranberries. Can't wait to bake this cake. sometimes too many things in the fridge that's why causes us to be so blind, i also hv that problem too sometimes. sorry to hear about your uncle. So sorry about your uncle, Edith. However, you have very lucky neighbours! So sweet of you to make time to bake for them.